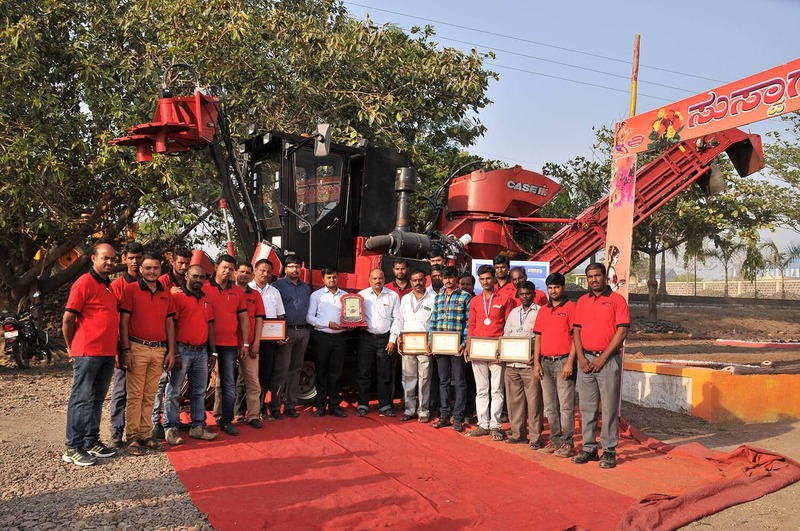 Case IH, a brand of CNH Industrial, recently bestowed the Karnataka-based sugar factory, Krishna Sahakari Sakkare Karkhane (aka Krishna Sugars), with the 'National Record' Award for harvesting 146 MT sugarcane in just 3.5 hours with the Case IH Austoft 4000 Series sugarcane harvester. In India, the 4000 Series has been performing well with 100 to 150 tonnes per day on average, with hourly average of 15 to 20 tonnes. However, Krishna Sugars have created a new record in the country reaching the best harvesting performance with 41 tonnes per hour. An award ceremony was organised at Krishna Sugars' premises in Athani, Belgaum district in Karnataka, at the end of April to celebrate this outstanding achievement in the presence of numerous guests. During the event, Mr Ramesh Kumar, Head of Crop Solutions Service at CNH Industrial, praised the operators of sugarcane harvester and in-fielders for their untiring efforts in this remarkable feat. Mr. Parappa C Savadi said. Sugarcane is one of the fastest growing crops in terms of land area worldwide and Case IH has a good understanding of what it takes to meet these challenges, thanks to its over 50 years' experience in the sugarcane industry. The brand has a rich history dating back 175 years to when founder Jerome Increase Case created a revolutionary threshing machine to speed up the separation of grain after harvest in 1842. The Case IH Austoft 4000 Series was first launched in India in 2010. Specifically designed for small to medium sized operations or for bigger plantations with reduced row spacing, it suits the Indian land conditions perfectly. Case IH currently assembles its sugarcane harvesters in Chakan, Pune. The assembly site is built on the lines of Case IH's international facilities and global standards, and it operates also an R&D centre. Case IH experienced and professional staff offers its Indian customers first-class support, including access to spare parts, after sales service, technical and training support. The 4000 Series harvester represents the pioneering spirit of Case IH and has become the best-selling sugarcane harvester in the Indian market, being recognized for its expertise in providing efficient sugarcane harvesting solutions. Today Case IH is the market leader in India with hundreds of machines in operation in various sugarcane belts. These machines have revolutionised sugarcane harvesting by significantly reducing the field-to-factory time and wastage during harvesting. Case IH supports its customers in India through a widespread network and aims at expanding its reach in the market by increasing the number of customer touch points including dealers, spare parts depots, service vans and mobile service bikes for quick assistance. Owing to the importance of maintaining the equipment efficiently and effectively, the brand has launched a special initiative; the 'Xpress Service', which provides instant support to customers by keeping support staff, parts and other facilities readily available in close proximity. In addition, the Case IH customer care centre is available in eight languages to support its Indian customers across the country and can be reached toll free on 1800 419 0124.